It seems I've fallen in love with you. The more I am imagining you, the more is the craving to have you. Your crispy yellow colour and the smack round looks make you tempting. Your one time taste makes me irresistible to have you more. You are versatile in your flavour – sweet, salty, spicy or chocolaty. Your limited production only in South India has made you a unique mark of their cultural heritage. The healthy benefits of your consumption are like cherry on the cake. I'm wondering if my readers could figure out who you are. The Banana Chips…! Just like the name suggests, banana chips are a processed form of bananas or plantains aka nendran; a formal nomenclature in terms of botany. They are an ethnic Kerala cuisine locally called 'Upperi'. These made-in Kerala chips are available all over the country now. Just like I talked about their versatility in taste, they have a variety in their manner of being served as well. If dried, devour it as a midday snack. If fried, complement your meal with them as a dessert. 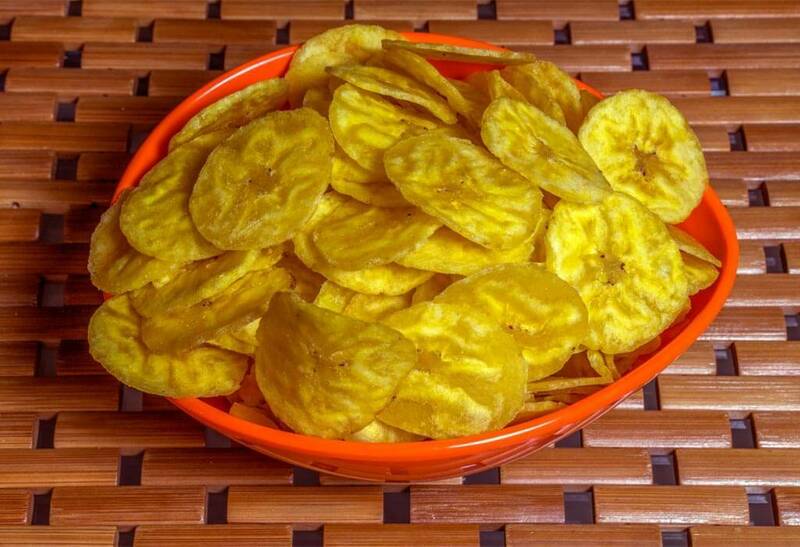 The dried chips are made of dehydrated well ripped bananas having an intense fruity flavour. They are usually available in plain taste i.e. no artificial flavour add-ons. The fried ones are made of under-ripe sliced bananas deep-fried in coconut oil or sunflower oil. Once fried, their serving composition may be enhanced with sugar coating or salt sprinkling or whatever pleases one's taste buds. If fried or dried to the right composure, banana chips do not look any lesser than gold coins. In fact, they have the golden healthy benefits of their consumption as well. Bananas in raw form are enriched with mostly all the vitamins and minerals but giving them a pioneering taste doesn't diminish their nutritional value much lesser. Rich in potassium, dietary fibre, iron and naturally sugary makes them a wholesome snack. Higher nutritional value in vitamins and lower in fats makes the consumption of banana chips over potato chips a little lesser guilty eating habit. Just like we have skilled homely chefs in almost every North Indian family for some finger licking sweets like Gujiya for Holi or sesame laddus for winters, we have south Indian family chefs proficient in making banana chips. With our generations becoming busier in their lives and evolution of technology, banana chips making has become more of a small scale industrial activity. Still they are an integral part of traditional Kerala feasts like Sadya or Onam. An apple a day keeps the doctor away. Have you ever heard someone saying, "A Banana a day keeps your workout on way?" Well, gym instructors suggest the die-hard body building fans to keep the intake of eggs, milk or banana high as it provides them the sufficient nutrients and energy to stay fit. There must be people like me who aren't fruit lovers and thus are devoid of grabbing the required nutrients from a fruity diet. To compensate the loss, we have banana chips and thus to keep a balance between a healthy diet and a not-so-high calorific intake, dried bananas are a suitable compensation. One-half cup, or 34 grams, of dried chips is equivalent to 1 cup of fresh fruit. The equivalents contains 4 percent of the daily recommended intake of potassium, 6 percent to 8 percent of magnesium, 3 percent of phosphorus and 4 percent to 6 percent of vitamin A. Potassium, magnesium and phosphorus function as electrolytes that help maintain fluid balance. Vitamin A promotes eye health and helps strengthen your immune system. A lot has been talked about healthy dietary benefits of yellow south Indian chips but not everyone is a fitness freak and we all give ourselves some liberty in food to please our taste buds often. So why not to experiment a little different flavoured bananas? The fried ones! They have their own expression of taste; be it with honey syrup or chilli flakes. Imagine yourself ordering a serving of chocolate syrup banana chips in dessert than the regular ice-cream or milky items. Trust me you won't be disappointed if you are a foodie like me for whom food with spiced up flavour is always a delight. I think it was more than enough to talk about the fascinations with Banana chips and if you have managed to read my article till the last byte and you like banana chips even a bit, you are definitely going to try them out and if you aren't fascinated at all with this fruit, you need a change to give bananas a try on how different can they taste apart from the routine fruity flavour.